Wednesday September 8th 1909 It is 29 years today since John & Hattie were married They are really now going their wedding trip over again. I did my ironing in the morning and we intended going to the fair but it began to rain. Will went down town awhile. I did a lot of mending and put things away. 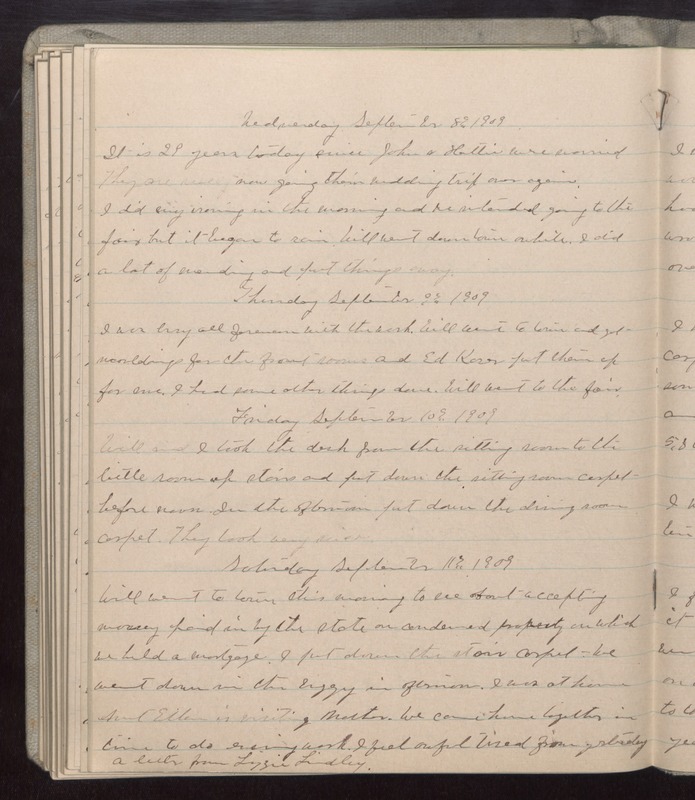 Thursday September 9th 1909 I was busy all forenoon with the wash. Will went to town and got mouldings for the front rooms and Ed [Karr?] put them up for me. I had some other things done. Will went to the fair. Friday September 10th 1909 Will and I took the desk from the sitting room to the little room up stairs and put down the sitting room carpet before noon. In the afternoon put down the dining room carpet. They look very nice Saturday September 11 1909 Will went to town this morning to see about accepting money paid in by the state on condemned property on which we held a mortgage. I put down the stair carpet we went down in the buggy in afternoon. I was at home Aunt Ellen is writing Mother. We came home together in time to do evening work. I feel awful tired from yesterday a letter from Lizzie Lindley.